When SNK Playmore finds a formula, it tends to stick to it (see King of Fighters XII, Metal Slug 7). The developer's latest entry in the Metal Slug series doesn't stray far from the path. It arrives strictly for the Nintendo DS — an Xbox Live Arcade version is due later — doing little to take advantage of the platform's unique hardware. What it does bring are seven new stages, three new Metal Slug vehicles and six familiar run and gun soldiers to choose from. Is Metal Slug 7 the luckiest of entries? Read our review to find out. Consistently Gorgeous Presentation: The Metal Slug series has traditionally wowed with its amazingly detailed sprite work, its over-the-top animation and effects providing almost as much entertainment as the run and gun gameplay. Metal Slug 7 doesn't disappoint, with lovingly crafted characters, vehicles, bosses and backgrounds. It's a visual feast, even at such a tiny screen size. Tried And True Gameplay: SNK Playmore may get some grief for not spicing up the Metal Slug recipe enough with the seventh core entry in the series. Fortunately, Metal Slug 7 does more right than it does wrong in attempting to keep the series fresh — even if some of the more amusing added flavours from previous Slugs are missing. Combat School Mode: There really isn't much meat on these bones for anyone who won't obsess over collecting every prisoner of war or single-credit play throughs. But Combat School — a series of challenges with specific requirements and graded performances — gives one something to do once they've seen everything in Main Mission mode. Chatting with your drill instructor Cynthia provides literal seconds of "enjoyment." No Multiplayer: Metal Slug 7 doesn't take advantage of the DS's wi-fi capabilities for multiplayer, making the game strictly a single player affair. Granted, having two people on the wee LCD screen amid all the explosive pomp may make for massive confusion and double the deaths, but we'd have loved the option. Really Doesn't Exploit the DS: It's not just the multiplayer via wi-fi, it's everything. No Nintendo Wi-Fi Connection support for leaderboards and stat-tracking, pointless touchscreen interface, no shouting into the microphone to switch weapons. Okay, that last one would be a horrible idea, but Metal Slug 7 feels a bit out of place on the Nintendo DS. For better or worse, Metal Slug 7 is a capable, familiar entry in the twelve year old series. It's squarely aimed, like most SNK Playmore stuff, at a small subset of fans of old-school gameplay. The new Metal Slug vehicles, particularly the Metal Gigant, are a blast to pilot and add a much needed dose of variety for anyone already six Metal Slugs deep. The graphics remain top notch and the gameplay is still solid. Fans will likely be satisfied, but anyone who hasn't yet gotten on board with Metal Slug by this point might not see what the fuss is about. But I'm more interested in ever in picking up the Xbox Live Arcade version, just to see these mechanical wonders at full-screen. 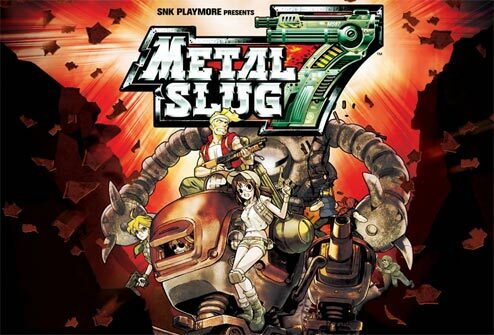 Metal Slug 7 was developed by SNK Playmore and published by Ignition Entertainment, released in Australia on Dec. 8 for the Nintendo DS. Retails for $59.95. Played through single player Mission Mode, completed multiple Combat School mode challenges.